I think I once saw in an old issue of GQ that a linen suit was one of a stylish gentleman's 10 Summer Fashion Essentials. And that it could (or even should) be scrunched into a ball for travel and then worn wrinkled. Since this is how I treat all my clothes, such care instructions appealed to me. But two pants and two shirts does not a suit make. 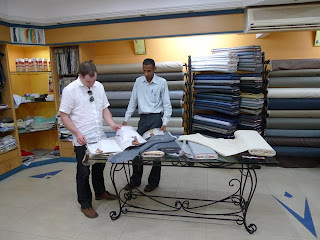 The next day, we visited a large tailors called Raymond's, where we were told we might find some linen material for a suit. Their selection of 100% linen was meagre. The salesman was pushing a 40/30/30 poly-linen-wool blend that, of course, would not do. 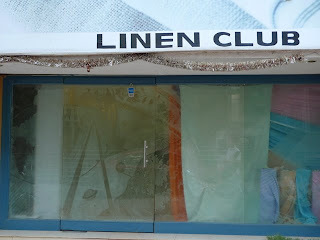 However, the salesman was nice enough to direct us to a shop called Linen Club. I was excited, because the name sounded very promising. The next day we managed to find Linen Club. A good assortment of linen, though not the cornucopia I was dreaming of in my restless night's sleep. I settled on a pure, 100%, unbleached, untreated linen, in a colour that can only be described as "linen". The salesman tried to convince me to have the tailoring done there, but I did not like the look of the garments in his catalog, and I appreciated the honesty of the man at Raymond's who was good enough to direct me to his competitor. 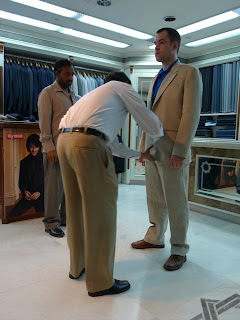 When the salesman pressed us as to who would be doing the tailoring, we made up a lie that it was being done by a tailor "private to the family." It sounded good but I'm not sure if he was fooled. "Technology yields to nature. Yarns and fabrics recapture their origin. Nature is synonymous with truth, authenticity, and also imperfection. As a beautiful face bears wrinkles, a beautiful fabric does even more so when it doesn't hide its imperfection. The best materials should have the appearance of being hand-crafted. Ecological luxury. The authentic replacing the technical." While the copy is a bit overwrought, I have to say I agree wholeheartedly. (Also, I think this would have got an 'A+' in my King's Philosophy of Technology class). On the car from the Linen Club back to Raymond's, I became anxious that the material I bought was too thick and scratchy for the comfortable, flowy, summer suit I was envisioning. I asked the chap at Raymond's, and he agreed that it was a bit on the thick side, but said if I didn't like the finished piece, I could just get another one made. I liked his logic. He asked a lot of questions: Center slit? Side Slit? No Slit? Lined? Unlined? Half-lined? I just kept telling him casual, Miami Vice, and summery. Together we decided on no slit, half-lined. I would be coming back for a fitting (they kept calling it "trial", which made me nervous- would I be found guilty if the suit didn't fit?) in a mere 48 hours. There is no shortage of labour here. The trial went moderately well. I came early, and only the pants were ready. They fit nicely and the colour didn't wash out my skin tone, which was another worry. After some beverages, we came back an hour later and the jacket was pieced together. I asked for the lapels to be narrowed and deepened and the length to be shortened. I have to say it was not very comfortable. Kind of scratchy and stiff - more like a linen tablecloth than anything. I am hopeful that a few cold water washes and some wear time will relax the fibres. But I have to say, it looks pretty sharp at the trial stage, and style trumps comfort any day. Guilty, of looking good. I think your blog postings could easily be turned into a best seller. Eat, Pray, Love, anyone? XOXO to you and Mel. You look very dapper in your chic suit. Is it turning into the garment you dreamed of? Linen can take years to get to know the wearer, so be patient. Keep up the posts. Hope you and Mel are having the time of your life. Your sartorial style is paralleled only by your on the point prose. I hope you and Mel continue to have adventures worthy of a Wes Anderson film.